A 5 Days Uganda Safari consists of chimp trekking in Kibale Forest, Nature Walks plus game viewing in Queen Elizabeth National Park accompanied with a boat cruise on Kazinga Channel. This channel connect Lake Edward o lake George. 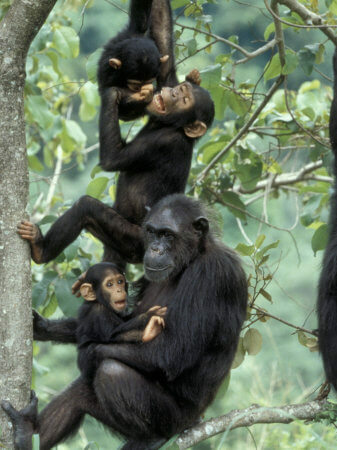 Kibale is the park with the highest numbers of chimpanzees in Uganda. Day 2: Chimpanzee Tracking in the Morning, Bigodi Swamp Walk in the Afternoon/Evening. Enjoy breakfast and go for a briefing at the park offices at Kanyanchu Visitor Center. Chimpanzee excursions usually begin at 8:00 am, so you have to be at the briefing point before this time. During the trek in jungle looking out for chimps, chances are that you will advantageously see more primate species like the red-tailed monkeys and colobus monkeys among the many. This forest hike will offer you an opportunity to spot birds plus insects including butterflies as you tread on the forest paths. After an amazing tracking, get back to your accommodation for lunch that would later be followed nature walk in Bigodi swamp. Bigodi Wetland Sanctuary is a perfect spot for watching birds and insects plus appreciating nature at its best. Bigodi is well-known for an affluence of biological diversity like primates such as the black and white L’Hoest monkeys, vervet monkey, the red colobus monkeys, grey cheeked, red tailed monkey, colobus monkey, blue monkey, mangabey and the baboons among others. Other primate species such as the mongooses and chimps also come to the swamp from Kibale forest. Other mammals include bush pigs, bush bucks, sitatungas and many more. The wetland is also an amusement spot for birders as it has 138 species of birds including the famous great blue turaco and many others. In the evening, get back to the lodge for overnight and dinner. Day 3: Transfer to Queen Elizabeth National Park. Day 4: Game Drive in Queen Elizabeth National Park, Kazinga Channel afternoon Boat Cruise. Take an early morning breakfast followed by a breathtaking Uganda wildlife game safari in the park. For a definitive African trip experience, the tracks via Kasenyi in the north of Kazinga Plains offer fundamentally assured sighting of antelopes, buffaloes, elephants and warthogs and baboons among others. Chances of spotting cats like lions and leopards are also very high as they are seen when they are awake to hunt. Seeing cats is the biggest pride of the game safari in the park. Day 5: Wake up late, Have Breakfast and Drive back to Kampala.